Jean Forestier (born 7 October 1930) is a former French cyclist. He was a professional from 1953 to 1965. Forestier won the points classification in the 1957 Tour de France, and wore the yellow jersey for two days. He also won the 1955 Paris–Roubaix. ↑ Augendre, Jacques (2009). "Guide Historique, Part 6" (PDF) (in French). Amaury Sport Organisation. Archived from the original on 3 October 2009. Retrieved 9 February 2010. ↑ "The Tour - Jean Forestier". Amaury Sport Organisation. Retrieved 9 February 2010. ↑ "53rd Paris – Roubaix, 1955". 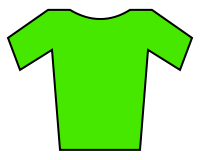 bikeraceinfo. Retrieved 28 April 2015.